“We all pretend to have an idol; we pretend to be an idol for someone else, but actually we are all imposters, a bit like a man on the street who appears totally cool and indifferent, while he has actually anticipated and calculated that all eyes are on him. I think that becoming aware of this general imposture would ease our love relationships. It is because I want to be loved from head to toe, justified in my every choice, that the seduction hysteria exists. Therefore I want to appear perfect so that someone will love me. (As the kids might say) WHAT. A. LETDOWN. It seems to me that a better answer, a better escape from this seduction hysteria is gospel oriented covenantal relationships in which people’s identities are formed around the notion of being “beloved of God” and find their purpose in his mission. One of the really valuable elements of the theological turn in the resurgent Calvinist movement is the application of the theological implications of the gospel in preaching. I take it that the point of preaching on this view is a sort of interpretive conditioning for the congregant, aimed at helping one to see reality rightly. The Spirit works through the gospel to convince me of the truth about who I am, what Christ is for me, and what I am in him. This sort of rehearsal of the implications of the gospel is really significant for everyday life because these truths form the background for how we perceive mundane realities from struggles at work to dealing with children (it deals with our hearts). And yet, I have a growing concern about truncating application to theological implications, namely, that it truncates biblical authority to the general orientation of the Christian mind. If preaching mostly pertains to theological generalities, there are a whole host of significant issues that have no place for being considered theologically in the church. Issues like global politics, economics, education, psychology, or even technology have no possibility of being addressed with theological nuance because there is no platform for talking about them. Thus, practically, the Bible’s authority does not extend to them. I think the worry from preachers is that one does not preach on “economics” because to do so is to step too far into the theological debatable or speculative. Without commenting on the merit of this argument for preaching, it is at least worth noting that this avoidance of the debatable or speculative has the practical effect of fostering terrible thinking about these issues in the church. In this Beginning, O God, hast Thou made heaven and earth, in Thy Word, in Thy Son, in Thy Power, in Thy Wisdom, in Thy Truth; wondrously speaking, and wondrously making. Who shall comprehend? Who declare it? What is that which gleams through me, and strikes my heart without hurting it; and I shudder and kindle? I shudder, inasmuch as I unlike it; I kindle, inasmuch as I am like it. It is Wisdom, Wisdom’s self which gleameth through me; severing my cloudiness which yet again mantles over me, fainting from it, through the darkness which for my punishment gathers upon me. For my strength is brought down in need, so that I cannot support my blessings, till Thou, Lord, Who hast been gracious to all mine iniquities, shalt heal all my infirmities. For Thou shalt also redeem my life from corruption, and crown me with loving kindness and tender mercies, and shalt satisfy my desire with good things, because my youth shall be renewed like an eagle’s. For in hope we are saved, wherefore we through patience wait for Thy promises. Let him that is able, hear Thee inwardly discoursing out of Thy oracle: I will boldly cry out, How wonderful are Thy works, O Lord, in Wisdom hast Thou made them all; and this Wisdom is the Beginning, and in that Beginning didst Thou make heaven and earth. Bad Art and the Tortured Beauty of the Cross from The Gospel Coalition on Vimeo. Of course any contemporary observer who saw Christ die would have listened with astonished incredulity to the claim that the Crucified was a Conqueror. Had he not been rejected by his own nation, betrayed, denied and deserted by his own disciples, and executed by authority of the Roman procurator? Look at him there, spread-eagled and skewered on his cross, robbed of all freedom of movement, strung up with nails or ropes or both, pinned there and powerless. It appears to be total defeat. If there is victory, it is the victory of pride, prejudice, jealousy, hatred, cowardice and brutality. Yet the Christian claim is that the reality is the opposite of the appearance. What looks like (and indeed was) the defeat of goodness by evil is also, and more certainly, the defeat of evil by goodness. Overcome there, he was himself overcoming. Crushed by the ruthless power of Rome, he was himself crushing the serpent’s head (Gen 3:15). The victim was the victor, and the cross is still the throne from which he rules the world. This is why I love the movie Bella (not to mention his sweet beard). Tammy Blanchard’s character experiences the pain and disorientation that is brought about by sin. Eduardo Verástegui’s character knows of this pain and disorientation all too poignantly. 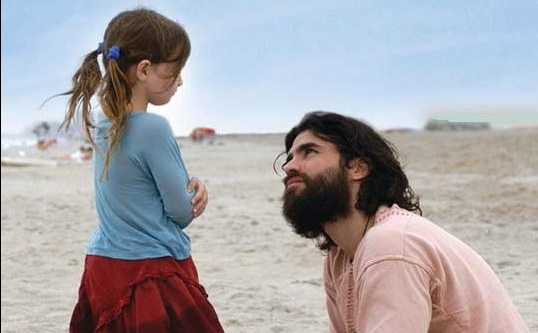 He, as the Messiah figure, steps in not to turn her life back to status quo, but to take upon himself that pain and disorientation and make possible this ‘all things new’ type of moment you have at the end of the movie. The pain has not been avoided or reversed, but absorbed by Verástegui, to create the opportunity for them to share this perfect moment on the beach in the end. If you’ve not seen the movie, it’s a must watch.